When it comes to planning your weekend, should it always end up doing your laundry, scheduling a doctor’s appointment or getting done with your plumber work? How boring! Although it is just a matter of 48 hours, every second counts to unwind you from your routine. So, don’t wait another minute! Get set your travel pack and book your flight to Dubai this weekend. Well known for its phenomenal skyline, architectural wonders, and unique desert encounters, Dubai has always topped the list of all the ‘No-Plan-Necessary Escapes’ and perfectly fits itself for the weekend ‘Holiday-Makers’. Keep rolling, check out what Dubai has got you and stand dumbfounded. Nothing could quite beat the iconic Burj Khalifa. 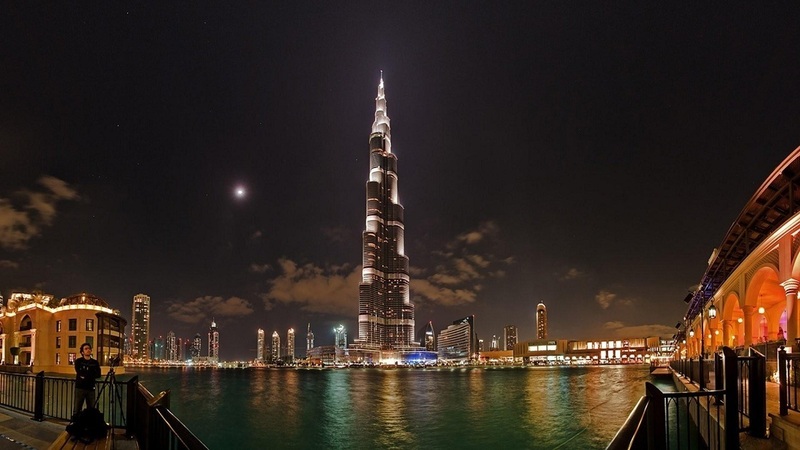 With its 828 meters, Burj Khalifa is a marvel of ultra – modern design reminiscent of Islamic art and architecture. No wonder! It stands as Dubai’s most popular destination. Hop onto the world’s highest observation deck and experience the most spectacular views of the city. Nothing could sound more luxurious than staying at Burj Khalifa and enjoying the most unique interiors, tower features, silver travertine and stone flooring. Know the history and journey of the ‘Great Metallic Skyscraper’ at the ground floor exhibition. Bask in the luxury lounges and enjoy an evocative dining with breathtaking views of the city at multiple levels of the building. The place serves best for those who are desperate to learn and live the Emirati culture and religion in a relaxed and open atmosphere. The Jumeirah Mosque is quite a large place and holds up to 1,200 worshippers. The white stone construction with a touch of medieval Fatimid tradition makes any visitor spellbound and tangled to the place. After exploring the mosque, soothe your tiredness with traditional Arabic drinks and many other varieties of food. 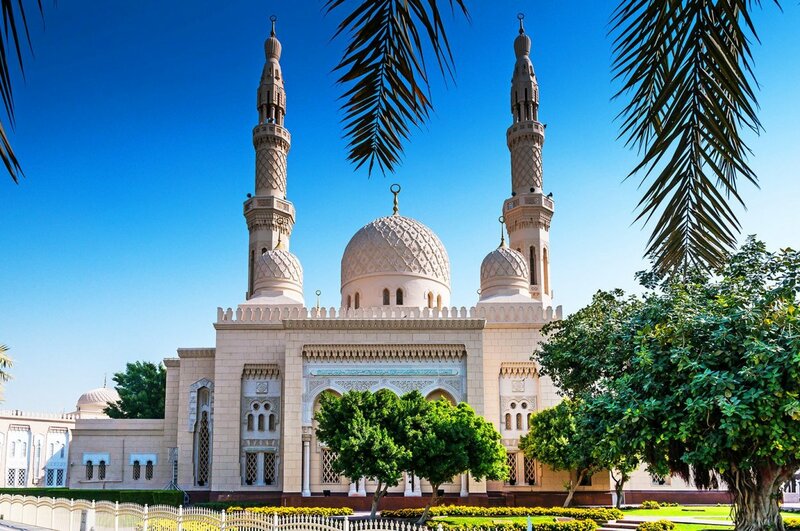 For an elaborate cultural cognizance, visit the Sheikh Mohammed Centre which offers a guided tour of the mosque on Sundays, Tuesdays, Thursdays, and Saturdays. No matter who you are – Muslim or Non-Muslim – Jumeirah Mosque welcomes you with a great sense of oneness. Spend a prime time to examine the raveled artistry of the mosque elevated especially when it is lit up at dusk. When it comes to Dubai traditional shopping spots it’s not just about baskets filled with spices, dried fruit, or cereals but it’s definitely more than that. 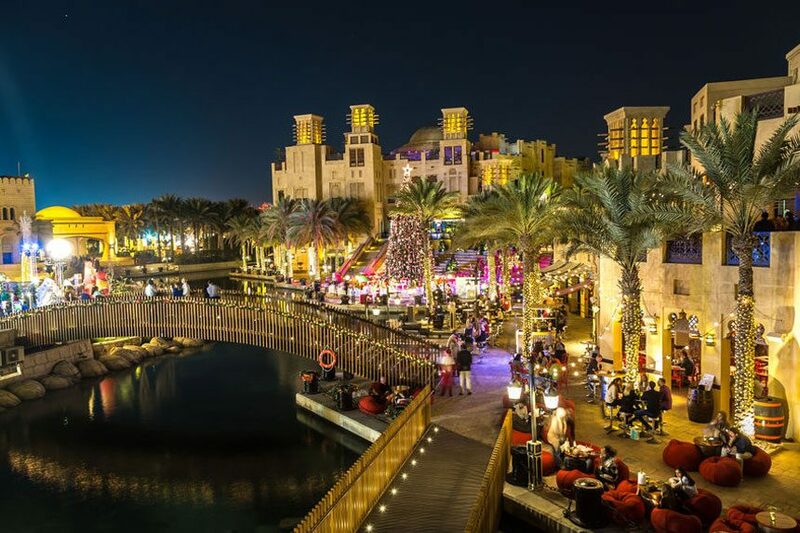 If you are in search of a shopping area where you can pick up the aesthetics of traditional Dubai as well as modern shops then Souk Madinat Jumeirah is the best-suited one. Accommodating huge extravagant shopping malls to small stalls the place is popular for representing Middle Eastern shopping cultures and Dubai’s growing trends. Shoppers can find fabulous Persian Carpets, African sculptures and Arab art in all forms. Souk Madinat is the one stop best place for fashion, and jewelry shopping. No doubt! Women would love the place and would never leave it empty handed. The glory is not all about the shopping but also about the show-stopping entertainment programs at the Madinat Theatre that makes the nightlife very lively. Street performances electrifying the whole area while you are browsing the boutique stores of the souk. A huge collection of Camel milk chocolates, Arabic Attars, Pashmina Shawls, everything that stands as the best of Dubai souvenirs – Pick a bunch of them to spread Dubai’s love to your loved ones. A continuous chain of excellent dining options – be it cafes, bars, lounges or gourmet restaurants –delicious food of versatile culinary styles is guaranteed. To experience a spectacular ride on the Burj Lake, set a sail on the traditional ‘Abra’. It is not just about sailing on the calm water of the lake but also the ride amazes you with the dazzling gush of water rising to a height of 500 feet in the air. 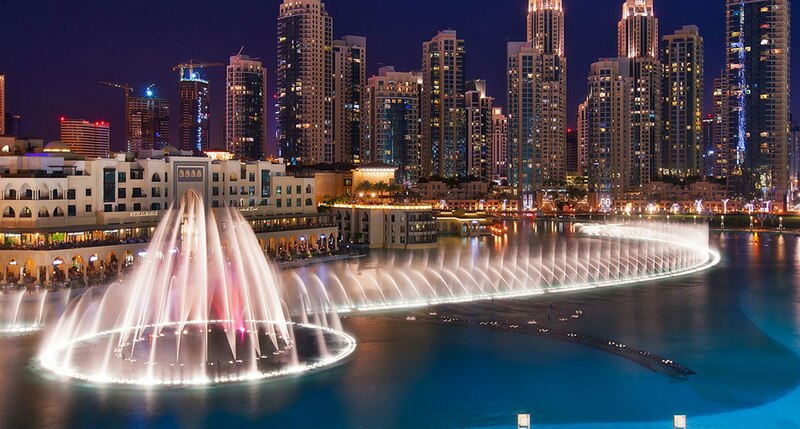 The fascinating Dubai Fountain show – world’s largest performing fountain– captivates you while performing an array of different songs from classical to contemporary Arabic music collections. Dancing water, music and light spectacles everything is perfect for setting the evening on a roller coaster. The Fountain is synched with classical, international and Arabic music where the musical pieces are a collection of Turkish, western, Iranian, Swahili, Chinese and Hindi songs. ‘A giant floating platform’ – During your ride on the lake, you get a chance to walk on the lake and see the dancing water fountain up very close. Desert safari on the Hummer Desert of Dubai would be a perfect pick to escape from the buzz of the city and explore the rugged desert terrains enthralling adventures. 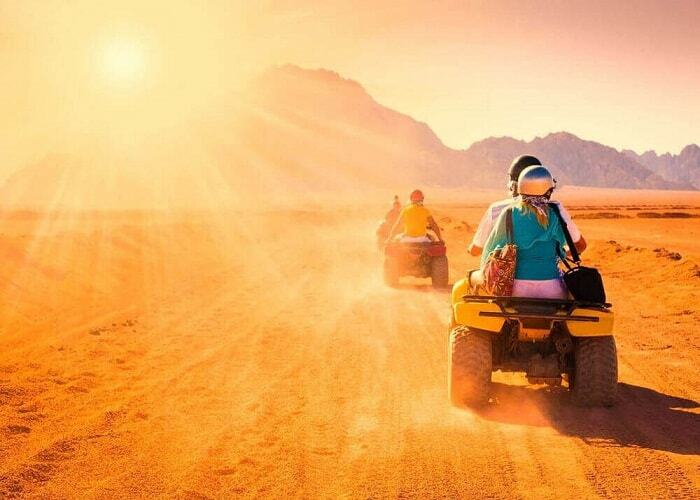 Experience quad biking, camel safari, sand skiing, exotic belly dancing, and tastes of traditional Arabic coffee with Dates and Shisha. After a long tiresome day-out, relax with a glass a wine and feast your eyes watching the magnificent sunset. And only one thing left before a good-night sleep – a sumptuous barbeque dinner under a Bedouin styled tent, in the middle of the cold desert. Can the sky look prettier? Sleep on the desert dunes with millions of stars all around, you will find your answer. Dress up in Arabic Costumes and pose for infinite clicks until you find the perfect one to Instagram. Listen to what Dubai Desert speaks to you. Experience ‘life of a living documentary’ by getting a glimpse of the strangest desert insects and vegetation. It is at the Majilis of the Jumeirah Mosque that one can discover Emirati camel milk ice cream in as many as 9 flavors. That’s something interesting. We would recommend our guests to try this delicacy.